Needs to display makeup files at high resolution. If not used, those will be displayed at low resolution. A little work is necessary after installing SKSE. "Pretty Face" only include female files. If you want to use textures for men, let's download "Pretty Face for men". Please choose from Vanilla, CBBE, UNP, depending on using body. In the SE version, all these are 2k, BC7. femalehead_msn.dds - same as one in female folder. It only includes male files. malehead.dds - Diffuse map, 2k resolution, DXT1 compression. malehead_msn.dds - Normal map, 1k resolution, no compression. malehead_s.dds - Specular map. 2k resolution, DXT1 compression. 2012.02.08 - v1.1 Less skin pore,less specular,little more ragged normalmap. 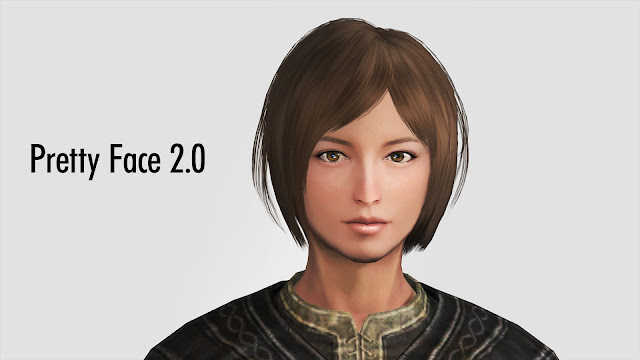 2012.02.22 - v1.2 Less nose skin pore,add eyeline,clean ears,more specular highlight around eye and lip,fix. More naturally skin tone. 2012.03.17 - v1.3 Delete Eyelashes Replacer.More Realstic Face.Almost invisible seam on the neck with the vanilla body. 2012.04.03 - v1.4 Fixed Normal map of the nose. Lip fix. Specular refinement. Fine-tune overall. 2012.04.18 - v1.5 Nose,Lip,Around-Eye fix.Remake eyebrows and tintmasks.Tintmasks bug fix in CK. 2012.05.06 - v1.6 Around-lip fix. Fine-tune overall.Increase specular strength. 2012.07.06 - v1.7 Thick around-eyes.Include Cute Eyes 1.2. 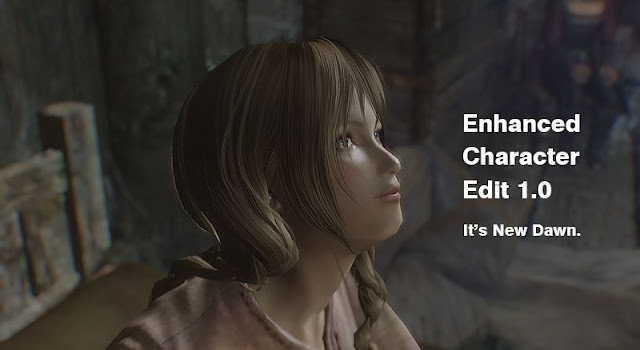 Remove Pretty Face with ECE Ver. 2013.09.25 - v1.8 More realstic textures. Added pretty face for men. Removed eyes files. Meshes fix and eyebrows files moved to option files. 2017.09.07 - v2.0 Renewed face and makeup textures. Intergrated symetry mesh file to main file. Added blankdetailmap. Abolished flatter version. UNP and CBBE version also include all necessary files. Changed makeup files resolution 256*256 to 1k. Changed face texture to optimal resolution and compression.